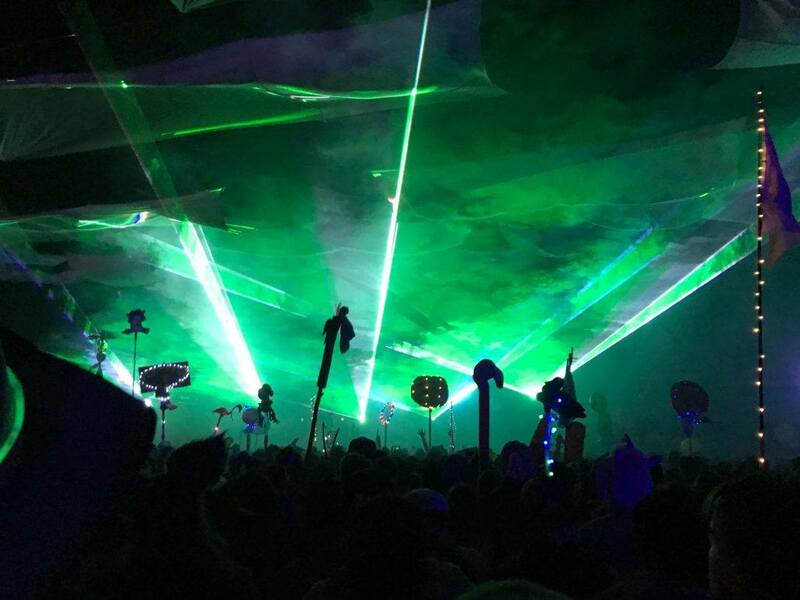 This Memorial Day Weekend was yet another beautiful and unforgettable Lightning in a Bottle (LIB) event. Festival attendees started showing up on Wednesday to set up camp and feast their eyes on the giant lake bordering the festival grounds. And thanks to northern California’s recent rains, last year’s dry lake bed was now a home for hundreds of inflatables and a hand full of floating DJ structures. The quick drive down from Santa Cruz was only two hours. I arrived Thursday afternoon and barely encountered any traffic while parking the car and setting up camp. Although the main stage music only began Friday, all the bars and smaller tents had music all day on Thursday for people to get their groove on. Thursday night included special guest DJ sets from Minnesota and Rufus Du Sol and of course many more! The three main stages of LIB stood near the edge of the water giving the audience a surreal view of the beautiful DoLab architecture and a lake view. Friday’s music included Scotland producer Sam Gellaitry, recent SCMF performer TroyBoi, and Rufus Du Sol. Then as the weekend came in, so did the heat. Most festival attendees were in the lake listening to the Woggie stage, home to the finest house music. My Saturday favorites were Two Feet, Psymbionic (who brought out Minnesota! ), Bob Moses, and Kaytranada. And Sunday’s best were Monolink, Big Wild, Bonobo, and …. bass-heavy Santa Cruz local Bassnectar! During the day, I spent my time exploring the various activities and structures set up around the festival. Pirate ship ruins and giant hammock structures overlooked the lake for a nice spot to rest. Yoga began at sunrise and went until around 8 every night. Fancy restaurants offered themed dining and four course meals. 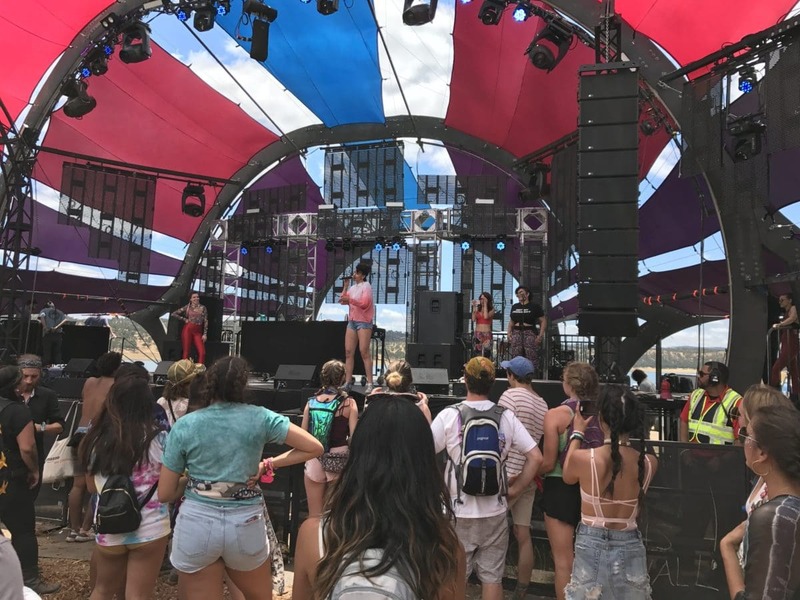 Speakers and workshops, including The Learning Kitchen, provided opportunities for attendees to learn from each other and the amazing people that help make Lightning in a Bottle the well rounded festival that it is. With no shortage of activities to experience and explore, Lightning in a Bottle will always be one of my top festivals. No matter where you are, no matter what time of the day, there were never any crowds and always plenty of music, artwork, and smiles around you. I’ll see you next year, Shanee.